The label is the name of the element and what shows up on the map. We automatically add a line break when the name becomes too long but if you&apos;d like to include your own line breaks, simply add a double space. This is quite useful when trying to make labels fit within an element circle rather than having the labels show up below the element. We&apos;ve customized the behavior of the type field for connections to allow for creation of pre and post labels that are common in causal loop diagrams. Check out the systems mapping guide to learn more. We recommend using the standard "reinforcing" and "balancing" terminology for loop types. You can then later use these types to decorate each loop based on whether it is a reinforcing or a balancing loop. If an image has been added to an element, you&apos;ll see it appear in the upper right corner of the profile. To be able to add an image, first create an field labeled "image" and then copy and paste the URL for the given image you&apos;d like to use. It will also show up within the background of the element on the map. The description is meant to include a narrative overview of what you are mapping. For a person, this may be a short bio and for a project it may be a quick summary or intended impact. You can add formatting (bold, italics), links to external websites, links within your map and to other maps, images, video and more through markdown. Make sure to read the Markdown Guide to learn all that you can add. We&apos;ve also extended Markdown&apos;s features by adding a powerful widget framework. Embed videos from YouTube and Vimeo or presentations from SlideShare and Speaker Deck (support for additional platforms on the way). Head over to the Widget Guide to learn how. 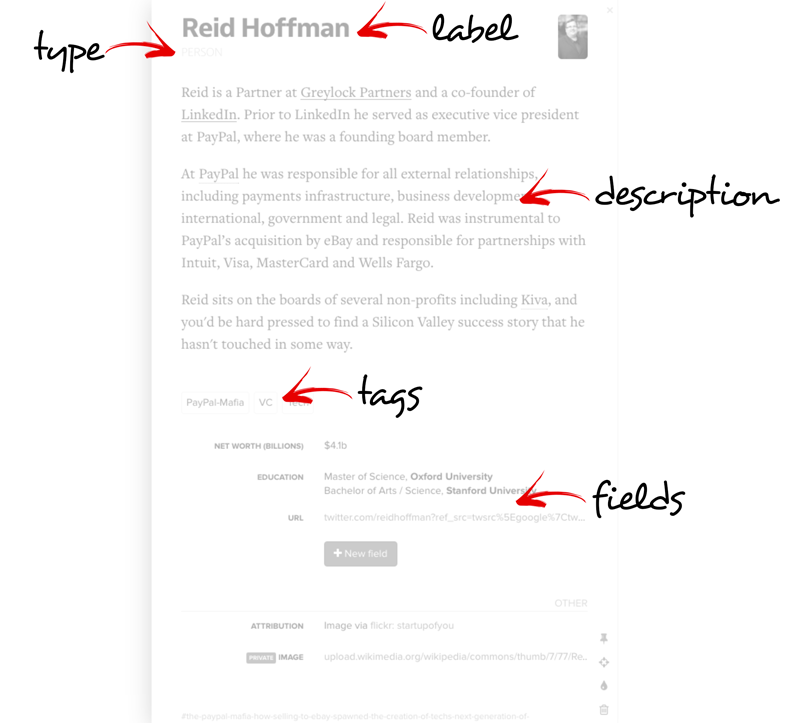 Tags are meant for storing short pieces of information that don&apos;t require the structure and label that come with fields. We recommend using single words without special characters but you are free to use tags as you desire. When you start typing a tag, Kumu will prompt you with other tags that have already been assigned to entities within your project. Fields are a powerful and flexible way to store more structured information for any given element, connection or loop. We recommend reading our fields section to learn all that you can do. Selectors provide a simple way to slice up your data. By keeping your field names and values selector friendly you&apos;ll be able to write much shorter queries. If you include special characters or multiple words you&apos;ll have to use the longhand instead (such as ["element type"="Government Sector"]) and that&apos;s just not nearly as much fun. You can swap out [description] for any selector. Values for the profile property can be either true or false.